Mini Roulette is a single-zero European style roulette game. It is made on the same basis as the standard roulette model but has a significant difference: the mini-roulette wheel has only 13 colored pockets representing 12 numbers and a single zero. Mini Roulette table layout is very much like that in a classical European roulette game, but again it has fewer numbers on it. The rules of Mini Roulette are quite the same as in other roulette games. 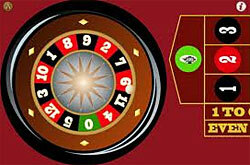 The players choose numbers and make their bets, and then the croupier spins the wheel and launches the ball. When the ball stops spinning, it falls into one of the red and black color pockets on the wheel. The croupier announces the winning number and gives payouts to the winners. The fact that Mini Roulette has considerably fewer numbers means that the system of bets in this type of roulette game is different than in European roulette. Actually, it is much simpler. The player can bet either on a single number from 0 to 12, or on a whole 4-number row (3-6-9-12, 2-5-8-11 and 1-4-7-10), or on any of 6-number groups placed close by on the layout. There are also even-money bets like Even/Odd and Black/Red. Bets on Black/Red, Odd/Even and Sixers bets pay 1 to 1 - just like even money bets in the European or American roulette. Also, Mini Roulette players have an opportunity to save half their bets if zero comes out. In such case no one loses his or her bets and half of the money is returned to the players. So, even if you don't get your winnings, it is still better than losing everything. Even though the paybacks in Mini Roulette are fewer compared to that in European roulette, playing this game is still a more secure way to increase your funds. The thing is there are only 13 possible winning numbers in the game, while in European roulette you are supposed to guess among 36 numbers. Besides, in Mini Roulette, if you make your bet on any number or group of numbers and zero is the result, you will still get back 50% of your bet.